It must have been 10 years ago when I first saw Scheer's stunning cactus bloom on Dryland Mesa here at the Gardens: I had to have it! The extraordinary blend of gold and amber reminded me of the heady contents of whisky bottles, or trout streams in late summer with their cognac water tints glinting in the mellowing sun. This extraordinarily beautiful cactus blooms on and off through the summer, usually a few days after a downpour. I took this picture in my own cactus garden: never have I seen so many blossoms open at one time (obviously celebrating the downpours of mid August). 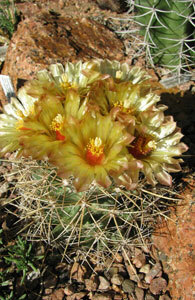 This cactus is very rare in Southern New Mexico, a bit less rare in the Texas Big Bend, but definitely recondite. You can nonetheless buy it (as I have done) in the spring at the Annual Colorado Cactus and Succulent Society sale or if you can't stand to wait, you can get it direct from Rio Grande Cactus Nursery. Long live the recondite! ‹ Previous Article: More recondite plants #2: hardy giant pelargoniums on rampage!